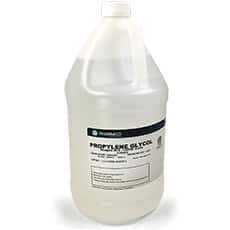 ACS USP/NF, Kosher 99.93% Grade Propylene Glycol, 1gal for sale. Buy from The Science Company. Our USP grade propylene glycol is manufactured to exact FDA specifications. It is a clear, colorless, odorless, viscous liquid. Soluble in water, acetone, and chloroform. Popularly used in liquid soap making, home made body lotions, and DIY e-liquids used in electronic cigarettes. USP Propylene Glycol is industrially used to manage taste and flavors in food preparations, retain moisture and taste in animal feed, and as a carrier of active ingredients in pharmaceutical and personal care products.